Stryker not only maintained their operations on schedule but executed their works in a professional manner. Stryker Electric is a top notch #1 rated industry leader in the electrical market place encompassing the State of Florida. Stryker's project site team worked hard to maintain a clean and safe working environment while working seamlessly with the other trades on the project to keep the progress of the project moving. Stryker took the initiative to identify design errors and omissions and make recommendations for corrections. 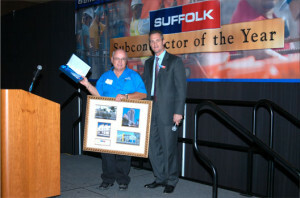 Stryker Electric receives sub-contractor of the year award. Stryker’s principals are all hands-on individuals with the corporate culture to provide the client with quality and time performance. I am writing to tell you of the wonderful experience I had with our recent Bogen PA repair. I had called Bogen directly for a recommendation for a local repair person and they gave me the number for my closest distributor, Stryker Electric, in Palm City, FL. When I called Stryker I was able to speak to Mr. Roy Cullipher, Bogen Account Executive. Mr. Cullipher came to my school the very same day and fixed the problem for us within an hour. Mr. Cullipher went above and beyond in his service to us and this is the reason I am letting you know. I would highly recommend, Mr. Roy Cullipher, and Stryker Electric to any school experiencing trouble with their Bogen PA system or any electrical matter. He was efficient, professional, knowledgeable and kind. It is with great pleasure that Bouygues Civil Works Florida Inc. ("BCWF") writes this reference letter for Stryker Electrical Contraction ("Stryker"). BCWF selected Stryker to provide a wide array of Electrical Services, including the installation and maintenance of surface Temporary power services for all operational needs such as power for the slurry & waste water plant, Temporary power service for all tunnel construction activities for the TBM Machine and its conveyor belt system as well as Fiber Optic installation, all in connection with the Port of Miami Tunnel Access and Improvement Project ("POMT"). Stryker not only maintained their operations on schedule but executed their works in a professional manner. Additionally, because Stryker was sensitive to the schedule needs of the Project, Stryker met BCWF's expectations with their can-do attitude, their understanding of and their passion for the task at hand. The Port of Miami Tunnel is a successful project thanks in part to the dedication of the hundreds of businesses with whom BCWF had contracted. Stryker has become a part of the BCWF family and recommends Stryker without reservation. Stryker Electric is a top notch #1 rated industry leader in the electrical market place encompassing the State of Florida. Our company has been doing business with Stryker Electric for the past 18 years and their quality of work is superior, their vision outstanding and their timely execution of the projects scope of work is first-class. Leadership, approachability, quality workmanship and professional installation best describes Stryker Electric. Their field craftsman are among these best we have ever worked with and their office personnel are extermely friendly, customer oriented and courteous, When you are done speaking with Stryker Electric you feel you are their best and only customer in their organization. Stryker Electric has always been a dedicated Team Player and looks out for the best interest of the project and all parties involved. Their word is their bond and that is extremely admirable in today's market industry. We have always been on a winning team when working with Stryker Electric on large projects from high rises to college campuses and airports Stryker Electric high standards are always present. When our company thinks of high quality commercial electricians only one comes to mind - Stryker Electric! This letter will serve as a reference to Stryker Electrical Contracting, Inc. who was an irreplaceable member of the Morganti construction trade team at the Martin County High School Admin/Science/Career Building in Stuart, Florida, which had an Electrical Contract Value of over $1.6 Million. With Stryker's assistance Morganti and the team were able to deliver the owner an exceptional property while overcoming numerous design and schedule obstacles. Strykers ability to be a flesible team member and help drive the flow of construction allowed Morganti and its team to complete this premier project ahead of the Owner's project schedule. When the opportunity presents itself, Morganti would not hesitate to use Stryker to an Contractor Construction Manager that needs a quality Electrical Contractor. This letter will serve as a reference for Stryker Electrical Contracting, Inc. who was an irreplaceable member of Suffolk's Trade team at the Sinai Residence project. The project was a 616,000 sq. ft. Continuing Care Retirement Center consisting of 240 Independent Living units, 48 Assisted Living Units, and 60 Skilled Nursing Units, two commercial kitchens, six dining rooms, three bars, a rooftop putting green, three landscaped courtyards, three second floor green roof gardens, two card rooms, one multi-purpose meeting room, four craft/activity rooms, two reading -library rooms, seven fireplaces, a free-standing Fitness center with an outdoor convered pool, yoga room, fitness/aerobics room, massage rooms and beauty salon and a 220- car Parking Garage, located in Boca Raton, Florida with an Electrical Contract Value of over $12 Million. With Sryker's assistance Suffolk and the team were able to deliver to the owner an exceptional property while overcoming numerous design obstacles. Stryker's ability to be a flexible team member and help drive the flow of construction allowed Suffolk and its team to complete this premier projcet with a minimal amount of imapct to the project schedule. 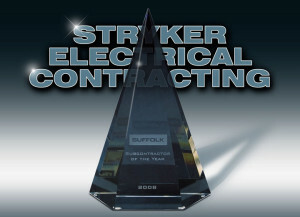 When the opportunity presents itself, Suffolk would not hesitate to use Stryker's services again and would highly recommend Stryker to any Contractor or Construction Manager looking for a qualitry Electrical Contractor who is committed to the team and the project. Pirtle Construction Company has worked successfully with Stryker on a variety of projects and found them to be a professional and reliable firm. Most recently, Stryker was the subcontractor for the electrical and systems work on a 400,000 square foot, 3 story high school project. In addition to being a very large project, the project had numerous design inconsistencies and contradictions. Stryker showed flexibility In schedule, quality in workmanship, and cooperation with other subcontractors. I would like to especially commend Stryker in taking a proactive position on the design issues on the project. Stryker took the initiative to identify design errors and omissions and make recommendations for corrections. Stryker continuously worked cooperatively with the design and construction management firms to ensure these corrections got made without any impact to the construction schedule. I would and have recommended Stryker to be the preferred electrical contractor on any and all future projects. recommend Stryker for any electrical work FDOT may wish to consider them for. They have completed tens of millions of dollars worth of electrical work for our company, all without problems or call backs later on. I will be happy to answer any further questions you might have about this fine company. This letter is to provide a reference to your office for Stryker Electrical Contracting, Inc. in consideration of them being selected for the Florida Department of Transportation. Pirtle construction has had the pleasure of working with this firm since 2003 on many highly successful construction projects. These projects include several quality K-12 educational projects which were both Construction Manager at Risk or Design/Build projects. We consider Stryker Electrical Contracting, Inc. as one our best large electrical contractors. They have proven time and time again for quality construction, excellent administrative organization and meeting their schedule. They are a quality electrical firm that continually works with Owners representatives, Engineering consultants and other project team members to ensure successful completion of our projects. Stryker Electrical has been one our premier subcontractors that continually meets the challenges of each project without exception. It is my pleasure to provide a reference letter for Stryker Electrical Contracting, Inc. (Stryker). I have maintained a professional and working relationship with Stryker since 1992. Throughout that period, Stryker has performed electrical services on major building and civil construction projects. I have always found their administrative, management and field staff to be responsible, hard working and honest. Stryker’s principals are all hands-on individuals with the corporate culture to provide the client with quality and time performance. Stryker will be another important contractor asset to the Florida Department of transportation. If you have any further questions, to not hesitate to contact me.